The main chamber is square in plan with a central altar, and the front chamber is rectangular in plan. Both are connected by a long corridor. In the Maitreya sutra illustration in this cave, there is an inscription in ancient Tibetan and an image of a wedding ceremony of a Tibetan man with a Chinese woman, from which it can be determined that it was constructed in the period when Guazhou was occupied by the Tibetans and Shazhou was not yet, namely from the 11th year of Dali era (776) to the second year of Jianzhong (781). Part of the ceiling of the main chamber has collapsed, and the front chamber was renovated in the Five Dynasties. The original paintings are well preserved. On the east wall is a Mandala of Eight Bodhisattvas, on the south wall is an Amitayus sutra illustration, and on the north wall is a Maitreya sutra illustration. On both sides of the illustration are single images of Avalokitesvara, Mahasthamaprapdta and Kistigabha bodhisattvas. On the two sides of the entrance in the west wall are illustrations of Manjusri and Samantabhadra. In the front chamber, the south side and north side of the east wall respectively depict Vidudabha and Vaisravana, who protect the paradise of Buddhism. The north side of the east wall is devoted to the images of Rocana Buddha and four great bodhisattvas (partly damaged on the south side), namely the Sambhoga-kaya of the Trikaya. In esoteric Buddhism, he was shaped as a bodhisattva sitting in lotus position with hands below the belly, one above the other. The proportionate and plump body exhibits the characteristic of Esoteric Buddhism. The four great bodhisattvas are as follows: Ksitigabha, Manjusri, Akashagarbha and Maitreya, all sitting on a lotus throne with a twisted stem. On the east side is Medicine Buddha in patched kasaya who stands barefoot on a lotus and holds a scepter in his right hand and a bowl in the other. The north wall is covered with an Amitayus sutra illustration, in which Amitayus Buddha sits in lotus position on a diamond throne flanked by Avalokitesvara and Mahasthamaprapdta. Around them are attendant bodhisattvas. The middle pure land of Amitabha Buddha together with Sambhogakaya and Nirmanakaya on two sides forms an Assembly of three Buddhas. In front of the hall are platforms for dancing and music performance, where various music instruments are played and Kalavinka and musicians dance together. In the back are high towers and pavilions connected by winding corridors. In the sky, music instruments play heavenly music without a performer, and apsaras fly around the parasol. Red lotuses grow out of the green water, on which incarnated children are playing. What a happy and peaceful scene. Below them are six male donors of the Song dynasty. The south side of the entrance contains a Samantabhadra illustration, in which Samantabhadra rides a six-tusked white elephant driven by a Kunlun slave and moves slowly. Below it are eight male donor figures of the Song dynasty. The north side contains a Manjusri illustration, in which Manjusri holds a Ruyi (an S-shaped ornament) and rides a black lion. His attendants hold the parasol over his head. In front of the lion is a child offering flowers, suggesting that Manjusri was on his way to an assembly. Below it are nine female donor figures of the Song dynasty (obscured). A Maitreya sutra illustration is rendered on the north wall, in which the preaching scene of Maitreya under the dragon-flower tree together with the two Assemblies of Maitreya on the two sides form a structure of triangle. In front of Maitreya are scenes of King Sankha presenting seven national treasures and a treasured pagoda to Maitreya, Maitreya the giving the pagoda to Brahmen, and the Brahmen pulling down the pagoda and getting their own share. These stories embody the philosophical ideas of Buddhism: life is impermanent and very short, only renounce the secular world and practice in seclusion can people get rid of the disasters in secular life and enter the pure land. The middle part consists of many small scenes describing the wonderful things happened in the world of Maitreya, including people never picking up anything on the ground, living without closing the door at night, once sowing leading to seven harvests, clothes growing on the trees, women getting married at the age of 500 years old and an old men entering into grave by themselves, as well as Kasyapa presenting a kasaya to Maitreya, Maitreya visiting his parents, Maitreya leading his disciples to beg alms in Ketsumati and etc. There is a bodhisattva image on each of the east and west sides and there are four Song dynasty female donor figures on the west side. A standing Avalokitesvara painted in the Song dynasty (the lower part is obscured). Part of the parasol of the Song dynasty is preserved. There is a three-headed six-armed Avalokitesvara on the south side and traces of Avalokitesvara on the north side, beneath it are traces of Tang dynasty paintings. On the space above the entrance is a scene of Vaisravana attending the Assembly of Nezha; On the north side of the entrance is an image of Vaisravana holding a pagoda in one hand and a spear in the other hand. He wears a crown and Tibetan armor and stands on a yaksha. In his front are apsaras presenting flowers and in the back are guardian generals. In the upper south corner are two disciples painted in the Five Dynasties. On the south side of the entrance is Virūdhaka shaped as a Han Chinese in full armor. He holds a sword in right hand with left hand in a certain mudra. 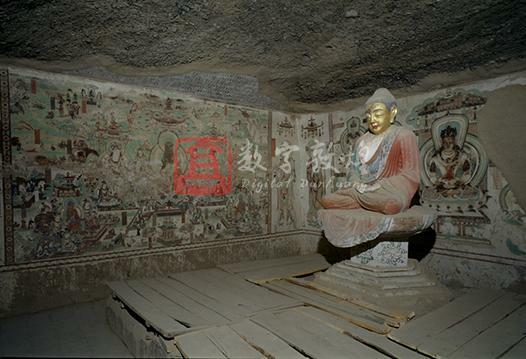 There is a standing Avalokitesvara image in the north upper corner painted in the Five Dynasties. On the east side is a preaching scene and on the west side three bodhisattvas (one is damaged due to the hole made in the wall), all painted in the Song dynasty. There is a preaching scene on each of the south and north sides of the entrance, painted in the Song dynasty. An image of a heavenly king (partly damaged) is painted on the east side, and three portraits of Cao Yuanzhong and his nephews with four attendants on the west side, all painted in the Song dynasty. An image of a heavenly king is painted on the east side (Tang dynasty paintings are revealed in the lower lower corner ), and two portraits of Lady Zhai, Cao Yuanzhong's wife, and her daughter Cao Yanding, with two maidservants on the west side, all painted in the Song dynasty.